In our usability tests with prior releases, we identified two common problems users encountered when trying to create a menu. 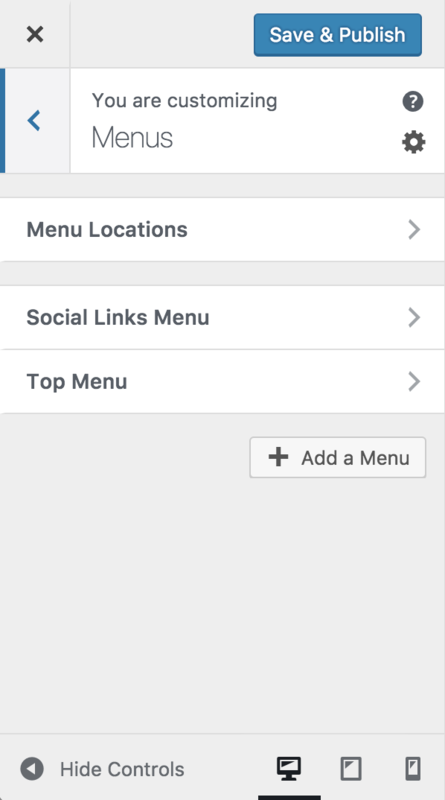 Clicking the Add a Menu button in an attempt to add a page to their new menu. Forgetting to assign the menu to a location. 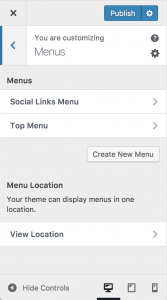 In WordPress 4.9, we’ve updated the Customizer’s menu creation flow to address these issues. The Menus panel layout and copy have been updated for clarity. The panel now shows menus first and locations second. This puts menus front and center and allows the panel to adjust more easily to specific scenarios. For example, when there are no menus, the panel asks users to create a menu and explains the steps to be taken. When the user clicks Create New Menu, the Customizer opens a dedicated menu creation section. Using a dedicated section allows us to guide the user through each step of menu creation. We start by inviting the user to provide a clear name for the menu and to select its new location. Once the menu is created, we guide them to add menu items and highlight the Add Items button if the user doesn’t find it after a short time. The locations section now allows the user to create a menu for a location that has not been assigned a menu. When the user clicks a location’s Create New Menu link, the Customizer opens the Menu Creation section with the location preselected. With the addition of a dedicated menu creation section, a number of classes are no longer used and are being deprecated. Is it possible to remove this section ? I tried to use the $wp_customize->remove_section(‘nav’) but it is not working. Is it a new section ?